An interactive guide to help family members of someone with chronic pain and problematic use of addictive substances. It explores the challenges of living with chronic pain and addiction in the family and offers ways to restore physical, mental, emotional and spiritual balance. The American Psychological Association’s 2014 survey on stress made an alarming discovery: America’s teens are now the most stressed-out age group in the country. Growing Up Mindful shows parents and professionals alike how to model and teach the skills of mindfulness that will empower our youth for the rest of their lives with greater self-awareness, resiliency, and confidence. 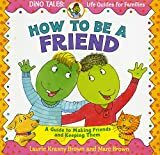 Fun dinosaur characters teach young children all about friendship–the value of friends, how to make friends, and how to be a good friend. Who can be your friend.How to show someone you would like to be friends.How to handle bosses and bullies.The best ways to be a friend and ways not to be a friend.Ways to settle an argument with a friend. #mentalhealth #stress #depression #anxiety Worry, Stress, Anxiety. How To Get Rid Of Them? : Overcome Stress and Anxiety and Improve Your Life.